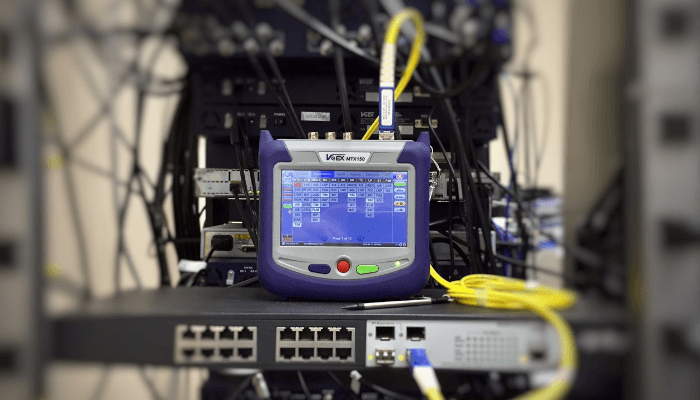 Internet connectivity over fiber optic networks has become the gold standard for fast, high-quality data transmission for businesses. Though still relatively new compared to other connectivity options, there are distinct advantages of fiber optic Internet. Fiber relies on light instead of electricity to transmit data, which facilitates much faster Internet connections that are capable of handling higher bandwidth. According to the FCC, fiber providers consistently offer 117% of advertised speeds, even during times of peak demand. So how does it stack against the traditional copper or cable coax circuits that are still available in the market? While most business decision-makers are aware of the speed benefits of fiber, other advantages are less commonly understood. Spending on a newer technology can feel risky, especially for organizations who rely heavily on their Internet connectivity for customer communications, productivity, and collaboration. In this article, you'll learn a bit more about the various ways fiber optic Internet compares to standard copper cable, including bandwidth potential, speed, and reliability, among other factors. Investing in fiber optic Internet can significantly increase your bandwidth potential. Copper wire infrastructure and TDM technology are limited in nature. Because it was originally designed for transmitting voice calls only, the demand for bandwidth wasn't high. For instance, T-1 can only carry 1.5 Mbps of throughput. And because of how electrical signaling works, many types of connections over cable are limited by distance. Is the speed increase of fiber optic Internet noticeable compared to cable? Absolutely. Many Atlantech Online customers using fiber to connect to our network can transmit data at 1 gigabit per second. That's many times faster than the federal government's definition of broadband service, which is 25 Mbps uploads and 3 Mbps for downloads as of January 2019. Tech blog NorthWest writes that downloads that take 22 minutes over most copper wire Internet connections can take as little as 8 seconds over fiber. The signal for copper Internet networks degrades as the signal is carried from the central office (CO). Fiber was originally used for long haul networks. Cell phone towers in remote locations use fiber optic cable to connect towers to the network. In an era of increased attention towards cybersecurity, fiber optic is touted as a cost-effective way of instantly increasing your Internet security. Intercepting copper cable can be performed by connecting taps to a line to pick up the electronic signals. Putting a tap on a fiber optic Internet cable to intercept data transmissions, however, is incredibly difficult. It's also easy to quickly identify compromised cables, which visibly emit light from transmissions. With distributed-denial-of-service (DDoS) attacks on the rise, it's more important than ever to have added security for your network. There are many factors that can cause outages when an organization is reliant on copper cable-based Internet. Temperature fluctuations, severe weather conditions, and moisture can all cause a loss of connectivity. Old or worn copper cable can even present a fire hazard, due to the fact it carries an electric current. Additional reliability concerns associated with cable include risks of interference from electronic or radio signals. Additionally, copper wires are accessed in the building by telephone company personnel and sometimes they can make mistakes and fiddle with the wrong wires. Also, copper wires all go back to the telephone company Central Office where disconnections can happen. Fiber is typically independent of the phone company, their equipment, and their termination points. The speed of Internet transmitted via copper cable is directly correlated with the weight of cable used. For a business to achieve higher speeds, more cable must be used, which requires more space in a company's telecommunications room. Fiber's speed is not connected to its size, and it's far lighter weight than copper. This renders it easier to use and less demanding on the limited space of small rooms. Investing in fiber Internet is more expensive than copper in the short term, though costs are drastically decreasing as this option becomes more commonplace. Ultimately, the total cost of ownership (TCO) over the lifetime of fiber is lower. It's more durable, cheaper to maintain, and requires less hardware. The advantages of fiber optic Internet make it a more cost-effective investment for organizations of all sizes. While organizational information technology needs can vary drastically, the advantages of fiber optic Internet are making it an increasingly common choice for business data transmission. Companies who choose to invest in fiber typically find that the total cost of ownership, bandwidth potential, and speed gains are noticeable. After selecting fiber, the next decision is who to choose as your Internet connectivity provider. To get this right, you need to ensure you're asking the right questions. That's why we've created a guide to share what you should ask and why it's important. 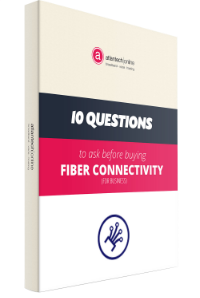 Be sure you're making the best choice for your business by downloading your free copy of 10 Questions to Ask Before Buying Fiber Connectivity now.